It seems like I have written a ton about HCL, but I still get many questions so I decided to write an all-in-one, all about HCL post to address any outstanding questions. HCL (with Pepsin) has been a game changer for me personally. I don’t believe I will ever know for sure why and how I got SIBO and why it has relapsed from time-to-time, but at this point, we are almost certain it’s due to my low stomach acid levels. When I was first diagnosed with SIBO in 2014, I could take upwards of 8 HCL with Pepsin pills at higher-protein meals and still not barely feel an ounce of burning. These days I’m down to about 3, and I simply stay consistent with that amount vs. going up so that I never get lazy with taking them. 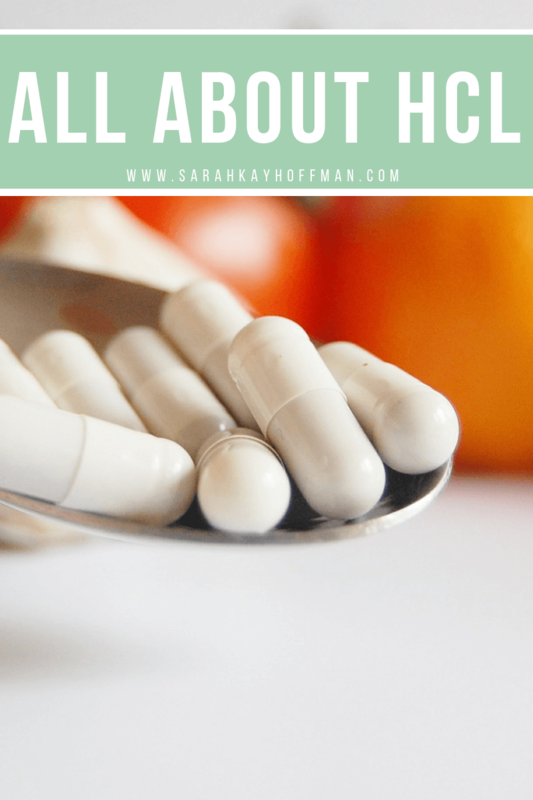 In this post, I’m going to share with you: all about HCL, what is HCL, how to tell if you have low stomach acid, how to take HCL (pill version), and who should not take HCL. All three posts are very comprehensive, and if you haven’t read them yet, I’d recommend starting there. The stomach produces hydrochloric acid as part of the normal digestive process. The breakdown and absorption of nutrients occurs at an optimum rate only within a narrow range of acidity in the stomach. If there isn’t enough acid, the normal chemical reactions required to absorb nutrients are impaired. Hydrochloric acid is required for proper digestion of protein, carbohydrates, and fat, as well as efficient absorption of vitamins and minerals. Low stomach acid production can be caused by H. pylori infection (the bacterium that causes ulcers), stress, acid-suppressing drugs, a vegetarian or vegan diet, and advancing age. How to Tell if You Have Low Stomach Acid? First and foremost, you need to know and be very clear and certain if you do or do not need to take HCL to help with digestion. Work with your doctor on this (or do the at-home HCL challenge if you don’t fall into any of the categories below). Taking HCL when you don’t need it is a huge mistake that could cause further damage to the GI lining. Make sure you’re taking a quality HCL that includes pepsin. Without pepsin, you are not likely to gain the full benefits of HCL. Only take HCL with higher-protein meals. For example, if you have pasta with red sauce, you would not take it. If you have pasta with chicken and red sauce, you would take it. Taking HCL without protein could prove to be a painful experience. Who Should NOT Take HCL? Even though I’m a huge advocate of HCL (I recommend the Thorne one HERE or the NOW Foods one HERE), there are definitely some people who should not supplement with it. Be sure to take special note if you fall in either of these categories. I hope this article has been helpful to you. For a comprehensive guide on gut healing, be sure to grab The Gutsy Girl’s Bible: an approach to healing the gut, 3.0. Hi there! Thanks for this helpful article. I have found a list of foods to add to increase stomach acid, but are there any foods to avoid that neutralize stomach acid too much? I feel like oats neutralize and stop my digestion. Not sure if it’s mental, but any insight is helpful! Thanks! My name is Hannah Wilcher, I am the Outreach Coordinator at YooHealth. I just wanted to send you a quick email to let you know that I recently published a very comprehensive blog post titled “ The Comprehensive Guide to Sleep Deprivation: Causes, Symptoms, and Treatment” While browsing your site, I noticed you linked to a same topic -https://www.sleepfoundation.org/how-sleep-works/how-much-sleep-do-we-really-need page from this page http://agutsygirl.com/2016/04/19/sleep-and-gut-healing/. I believe my piece is very comprehensive, (Over 5500 words – Many hours of research & writing) updated and quotes trustable sources. Thanks in advance for your time, and please let me know if you have any questions. I look forward to reading more of your stuff.